A popular Japanese tabletop game. 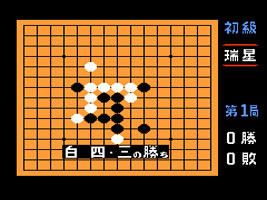 Three pieces are placed on the board (two black and one white). The goal is to arrange a line of five pieces in your colour, either horizontally, vertically or diagonally. Block your opponent from making a line without becoming distracted from your own. The game ends as soon as one player is guaranteed to win.. There are three difficulty levels. On the easiest difficulty the game shows you when the opponent is making a line. There is also a 2-Player mode so you can try your luck against a human opponent.